The Neighborhood Revitalization Initiative is a program designed to pursue our strategic goal of helping to transform and strengthen communities so those that reside in them will be able to live and grow into all that God intends for them. Fill out an application, attach income qualifying documents and proof to see if you meet income qualifications and exhibit ability to repay. Must be a homeowner who resides within Ellis County. Must agree to partner with Habitat to perform various sweat equity duties. 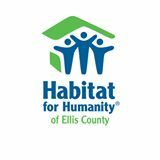 Repairs must be within the scope of work accepted by Habitat for Humanity of Ellis County (HFHEC). If you qualify, HFHEC will contact you to set up an interview and home inspection. Work will be completed by HFHEC volunteers and contractors. Which repairs do you need? Other repairs that would affect the health and safety of the homeowners.